Amla powder comes from the ancient Gooseberry Tree or emblica officinalis. It is used for hair and body and eaten in many countries. The body it reduces oils and dirt while cleaning your skin and refurbishing it. Our amla is for the hair, not consumption. Strengthen your hair and help your scalp or mild dandruff. Some have said it even slows the graying process of your hair. 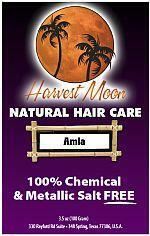 You can use amla weekly or monthly. Mix with warm to hot water to make a thick paste like yogurt. Apply to hair in layers and cover with shower cap when done. Leave on for a minimum of 20 minutes to one hour. Apply 3-4 days for severe scalp or once a month to maintain hair and scalp. For healthy skin use once a week or bi weekly. Some is better than none. Amla powder is high in vitamin C and also contains copper,zinc and chromium. Use as a face wash and gently scrub face or body. Amla is also great to lighten brown henna hair dye. it is one of the main ingredients in blond and ash brown.